Heading home? Use GrabHitch for 1 last booking on the way! Sign up now and earn extra $20 CASH this Friday! Find yourself driving home with an empty car? 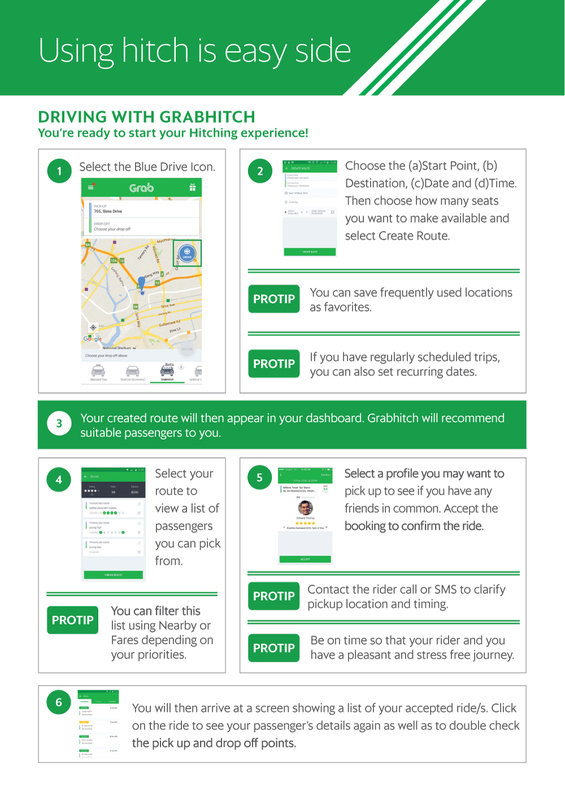 Why not pick up one last passenger heading the same way with GrabHitch! Special Promo for GrabCar partners: Sign up as a GrabHitch driver and complete 2 GrabHitch rides by 22 July using driver referral code “GRABFRIDAY” to earn an additional $20 CASH! How much commission does GrabHitch take from my rides? We take ZERO 0% commission from your GrabHitch rides so you will earn full fares from passengers you hitch! How much can I earn from GrabHitch rides? The average GrabHitch fare is between $8-12. Special promo: Sign up as a GrabHitch driver and complete 2 GrabHitch rides by 22 July using driver referral code “grabfriday” to earn an additional $20 CASH! The $20 will be added to your GrabHitch cash wallet. Is payment via Cash or GrabPay? Both cash & GrabPay payment modes are supported. Just like GrabCar, you always see the payment mode before you accept the job! Should I charge passengers for ERP fares or additional waiting time? No, unlike GrabCar, GrabHitch fares exclude additional charges. Do not charge for ERP or additional waiting time. Will GrabHitch bookings affect my AR/CR/Driver Rating? No. GrabHitch is a social service separate from GrabCar. What are the requirements? Can I register using my existing vehicle? As an approved GrabCar partner, you already fulfil our requirements! Simply sign up using your existing vehicle (both rental & own vehicles accepted). Note: For future vehicles changes, you need to change your GrabCar & GrabHitch information separately. 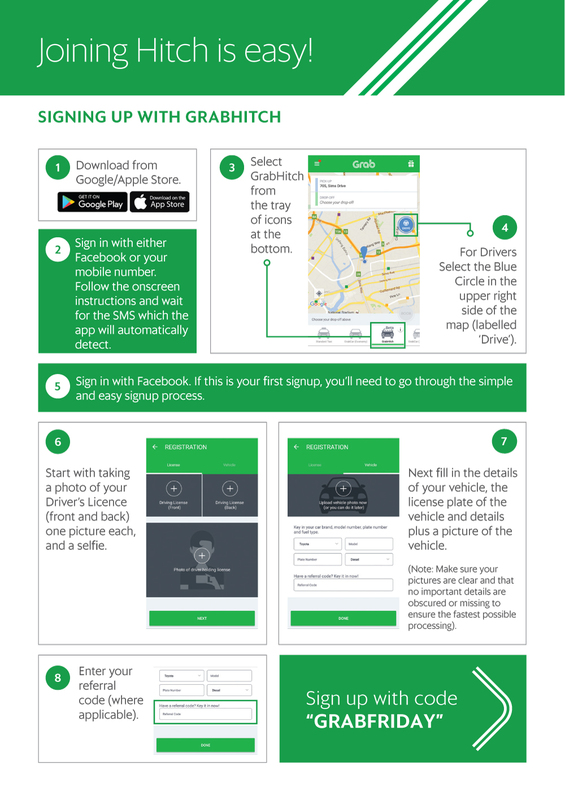 For GrabHitch, simply update the GrabHitch team via email (grabhitch@grab.com) with your old and new vehicle plate numbers and re-submit your new vehicle image through the GrabHitch app!